A California computer repair shop is likely to receive a call from Apple asking it to explain where it obtained an internal MacBook Air prototype that it later turned around and sold on eBay for $730. The auction listing for an "as-is" version of the ultraportable gives virtually no clues as to who at Apple allowed the system off-campus and has seen the poster take its images offline. An image link embedded in the auction points to Pleasanton, California repair shop iTech Systems, which specializes primarily in fixing old computers and sits across the San Francisco Bay from Apple's Cupertino headquarters. The posting cautions buyers that the system has a malfunctioning hinge and minor blemishes on the outer shell, but says little to give away its preproduction status other than to claim that it carries a 60GB hard drive and uses Mac OS X Tiger, neither of which has ever shipped with a production MacBook Air. A curious contributor from MacRumors' forums, however, chose to buy the system and has quickly discovered that the Air in question could only be a pre-production unit. The most prominent difference is a black bottom shell in place of the silver-colored aluminum from final hardware. Not to be confused with the reported possibility of a black carbon fiber underside for future MacBook Air units, the bottom appears to be a more simply fashioned housing that may have been temporary. 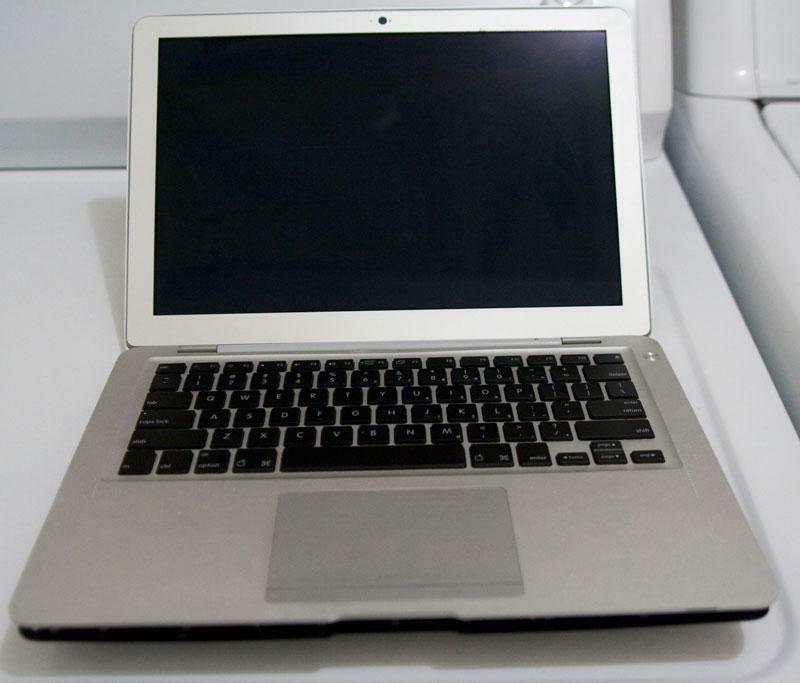 The MacBook Air prototype minus the product wording and with a different power button | Source: MacRumors forums. Other signs on the outside also tip off users that the computer is decidedly non-reference: the "MacBook Air" lettering is absent from the bezel, the power button has a brighter chrome-effect finish and the keyboard has neither backlighting nor the media and Mac OS X shortcut keys that would later make it to the finished product. Booting up the Mac only serves to reinforce this opinion. 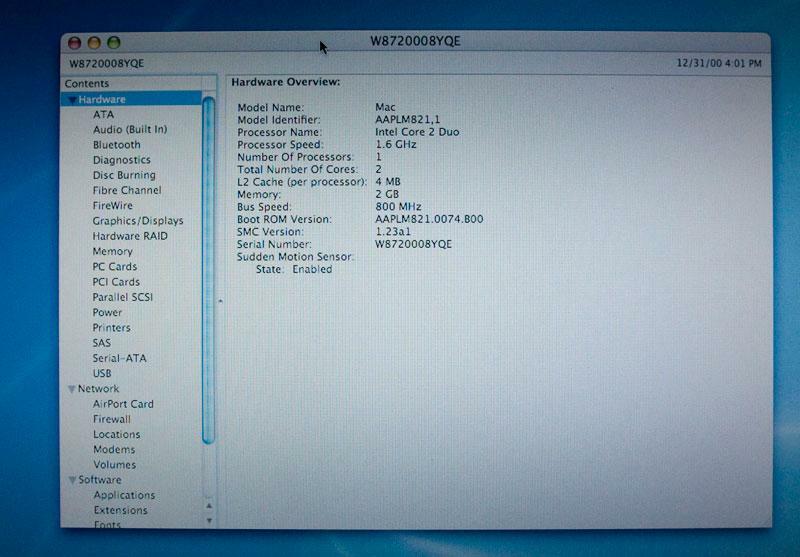 The system is preloaded with a pre-launch build of Mac OS X Leopard (more closely resembling Tiger) and has a serial number that produces a build date of May 2007 —eight months before the Air's public debut. The model number and boot ROM also refer to the system by its M82 codename. 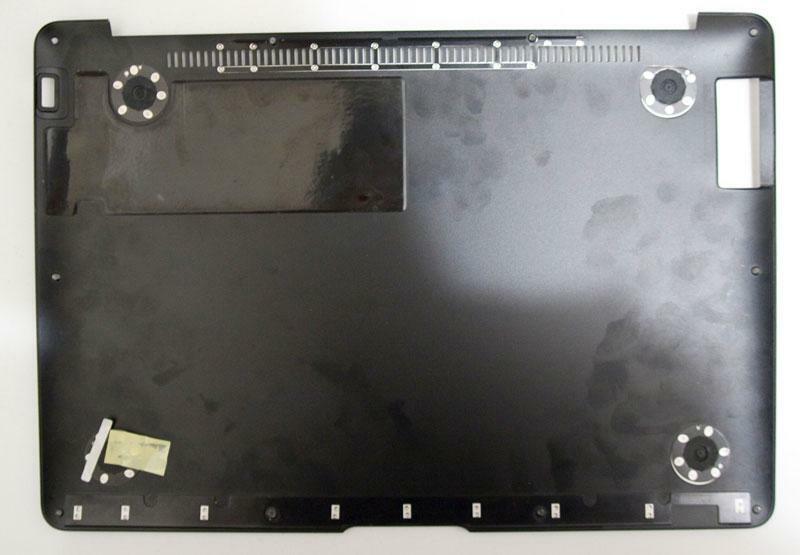 Such examples of Apple prototypes leaking to the public are rare, but not unheard of. In January 2007, an Xserve RAID prototype with Serial ATA connections reached the hands of an AppleInsider reader. That product was eventually canceled by Apple and so left the prototype as a rare snapshot of Apple's non-production experiments.